California high schoolers who have failed classes take makeup courses in larger numbers, and at higher rates, than most of their peers nationwide, a new study finds. About 12.9 percent of the state’s high schoolers attending schools with so-called “credit recovery” programs are enrolled in them. That’s 60 percent higher than the national average of 8.1 percent, according to a report released Thursday from the Thomas B. Fordham Institute, a right-leaning education think tank. And for schools that enroll 20 percent or more of their students in credit recovery courses, California is more than double the U.S. average. Large enrollment in credit recovery could indicate abuse, the researchers warned. Credit recovery allows students who have failed a class to make up the credits through alternative coursework. Although there’s no federal definition of what credit recovery entails, formats can include in-person courses with a teacher, “blended learning” that incorporates both in-class time and online work, or online programs without face-to-face teacher interactions. Students can take the courses during regular school hours, during school breaks or summers, on Saturdays or on their own time, depending on the program. Credit recovery in California and other states has ramped up in recent years, largely to satiate federal aspirations to boost graduation rates. California just last week posted a near all-time high graduation rate for the Class of 2018— 83 percent, only slightly below the national graduation rate of 84 percent in 2016, the most recent year available. Yet “there’s little evidence that students are learning more as a result,” Fordham’s report states. The report is one of the first times any nationwide data on credit recovery have been analyzed. Fordham’s report, using 2015-16 data from the Office for Civil Rights and National Center for Education Statistics, sheds light on how many schools have active credit recovery programs — meaning at least one student is registered — and how many students in those schools participate. Charter schools are included. But it laments how “reliable data are non-existent when it comes to how states and districts define credit recovery programs, much less when it comes to gauging their quality.” Other information, such as how many makeup classes students take and how many pass versus fail, also remains largely unknown. Previous studies have raised alarms that schools could be sacrificing the quality of students’ education — especially with online classes — to post higher graduation rates. A 2016 analysis of Chicago Public Schools’ online credit recovery program, for example, found students “had lower algebra assessment scores, grades and credit recovery rates” than those taking face-to-face courses. “For those of us who are concerned about maintaining standards and holding students to high standards, we get very worried when it seems like we maybe are just handing out diplomas,” Adam Tyner, Fordham’s associate director of research and co-author of the report, told LA School Report. 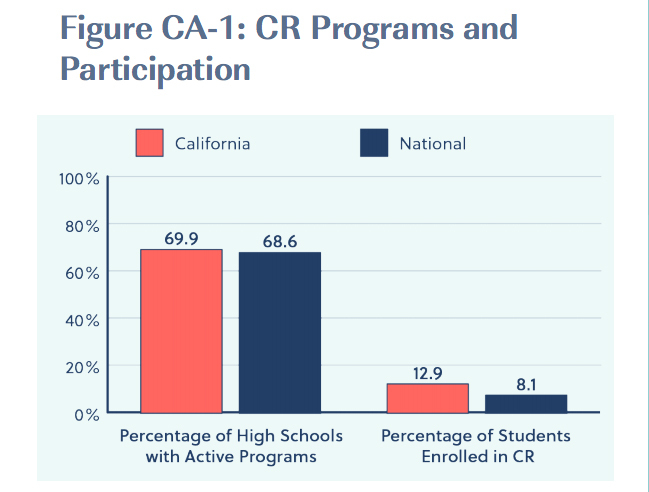 What Tyner found most compelling about California’s data was the extensive use of credit recovery — even though the state almost mirrors the national average for the percentage of schools with active programs. Nearly 70 percent of high schools in both California and nationwide enroll at least one student in credit recovery programs. 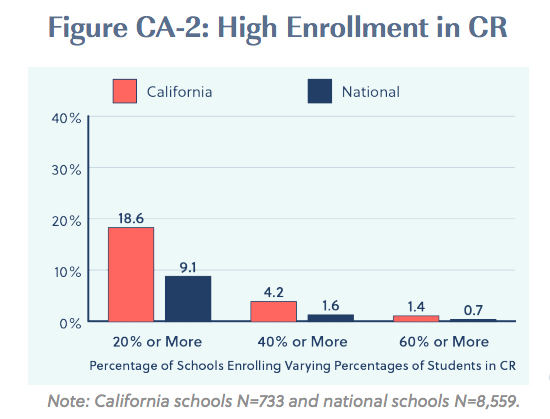 Yet in California’s case, about 18.6 percent of those schools register 20 percent or more of their students, more than double the U.S. average of 9.1 percent. Nearly 1 in 5 U.S. high schoolers who take credit recovery courses at actively participating schools are from California, according to data in Fordham’s report. That’s about 154,000 students in the state. A handful of the state’s school districts stood out in Fordham’s report for their high rates of students in credit recovery courses, most in urban areas. Urban schools are most likely to enroll large percentages of students in credit recovery, as are schools with large shares of low-income students or children of color. Of the 45 largest U.S. school districts with active credit recovery programs, seven are in California, including L.A. Unified, according to the report. 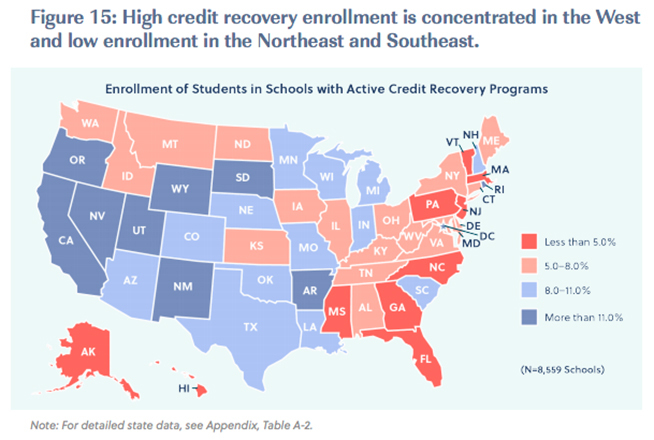 Four of those districts surpass the 8.1 percent national average of students in credit recovery. All are districts near either San Diego or Los Angeles, and they only serve grades nine through 12. They are Sweetwater Union High School District in Chula Vista just outside San Diego, Chaffey Joint Union High School District in San Bernardino County east of Los Angeles, Antelope Valley Union High School District north of Los Angeles, and Grossmont Union High School District east of San Diego. The most notable outlier in the report is Grossmont Union. About 99.7 percent of its more than 9,000 students who attend high schools with active credit recovery programs are in some type of makeup course. That’s 42.5 percent of the district’s enrollment. Tyner told LA School Report that Fordham “did contact [Grossmont] because they had such a funky number … but did not hear back from them.” He also warned against taking more localized data at face value. The percentage of L.A. Unified students engaged in credit recovery — 5.9 percent— fell below both the state and U.S. average, according to the data Fordham studied. That data, however, only accounted for the first year of the district’s so-far $45 million investment in credit recovery. There are also some discrepancies. While Fordham’s report counted nearly 4,500 L.A. Unified high schoolers in credit recovery in 2015-16, the district reported that 33,071 students had completed “at least one credit-recovery course” that same year, according to the Los Angeles Times. The district was unable to provide updated numbers or context on how it defines and tracks credit recovery by the time of publication. What is clear, though, is that as L.A. Unified has expanded its use of credit recovery, its graduation rate has continued to rise. After investing $15 million in credit recovery in the 2015-16 school year, the district’s graduation rate jumped 5 percentage points to 77 percent. But 42 percent of that year’s graduates had retaken a class they had failed or needed some other kind of credit recovery to do so, LA School Report reported. LAUSD’s credit recovery program boosts grad rates, but do students learn? The American Institutes for Research, funded by a $3.3 million federal grant, is currently studying the effectiveness of online credit recovery programming within L.A. Unified. Researchers are looking specifically at how “blended learning” credit recovery courses affect student performance in Algebra 1 and ninth-grade English. The study reviewed courses during the 2018 summer session and is continuing observations during the 2018-19 school year. The goal is to release preliminary results on the 2018 summer session in March, principal researcher Jordan Rickles told LA School Report in an email. 1. Adopt formal guidelines for credit recovery programs. 2. Districts should give separate assessments from what is provided via the credit recovery courses. For example, requiring students to pass the same end-of-course exams — or similar tests — as peers enrolled in traditional courses. 3. Require districts to collect more information, including whether courses are taken in person or online, the qualifications of the instructor and the types of test or exit exams required for each course. States and districts should “do a better job of vetting these programs, make sure that there are incentives in place to hold the line on accountability, and not just let everybody who shows up to school get a diploma,” Tyner said. Disclosure: The Eli and Edythe Broad Foundation, the Bill & Melinda Gates Foundation, the Carnegie Corporation of New York, the Charles and Lynn Schusterman Family Foundation, Bloomberg Philanthropies, the Doris & Donald Fisher Fund, the William E. Simon Foundation, and the Walton Family Foundation provide financial support to the Thomas B. Fordham Institute and The 74, the parent of LA School Report.